Beachview at dusk at Playa del Carmen, Yucatan. Here at Destinations, we’re conscious that places aren’t experienced in isolation: it’s about the journey, too. 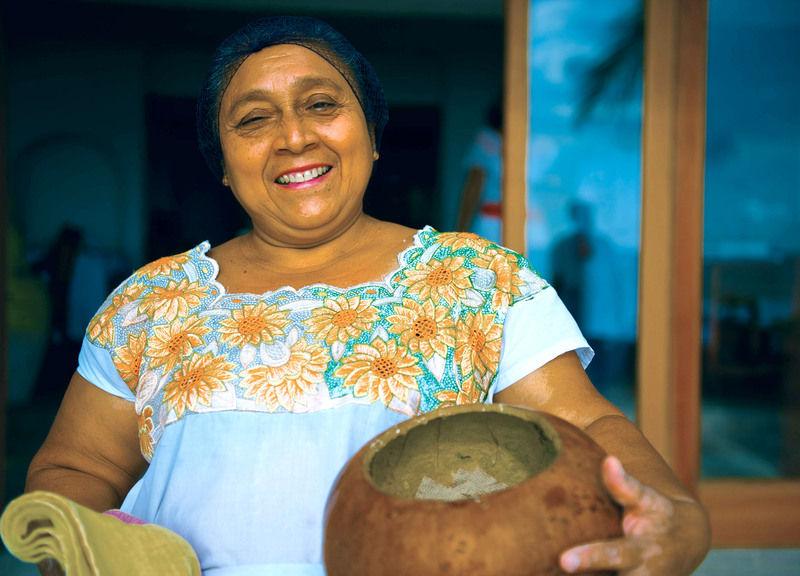 In the last of a four-part series exploring Mexico’s Yucatan Peninsula, we connect with Maya wellness culture and Mexican cuisine in Playa del Carmen. Sailing along the broad coastal highway connecting Tulum and Cancun, it seems I’ve left behind for good the natural and cultural communion of the former. The further up the coast one tracks, the more the landscape is overcome with mega resorts and other commercial enterprises — in this way, I picture a tide of development surging south from Cancun. 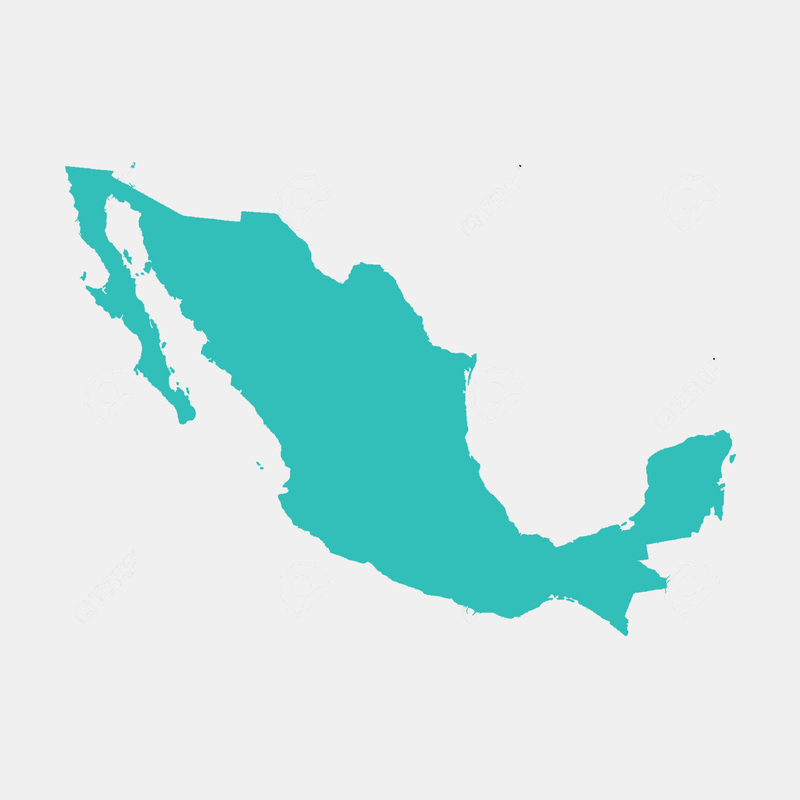 Just a one hour drive away, Playa del Carmen is located at the crest of the wave, and as such, I’m expecting a jarring transition. 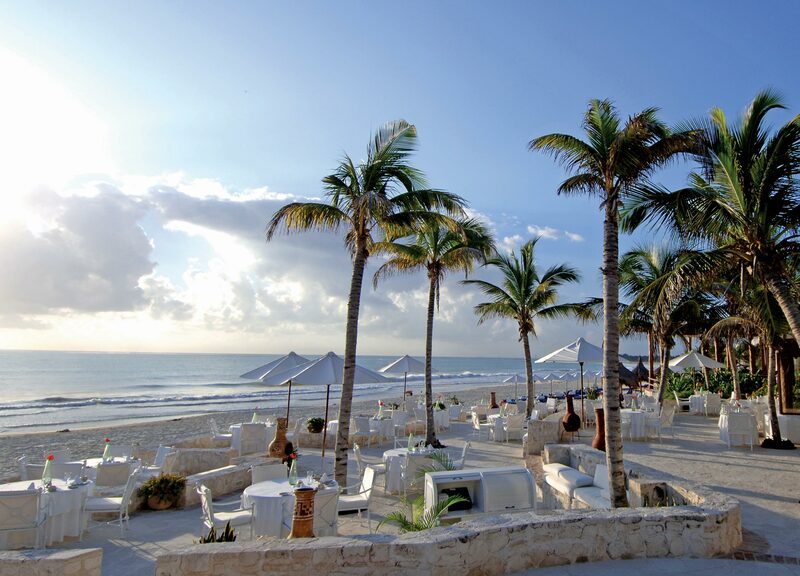 However, pulling off the highway at the understated entrance to Belmond Maroma Resort & Spa, I’m warmly greeted by name by the gate attendants, and any reservations begin to evaporate as I make my way down the long wooded driveway towards the ocean. Animal carvings line the way, a clue to the resort’s abundant wildlife. Looking out to the sunset from the terrace. 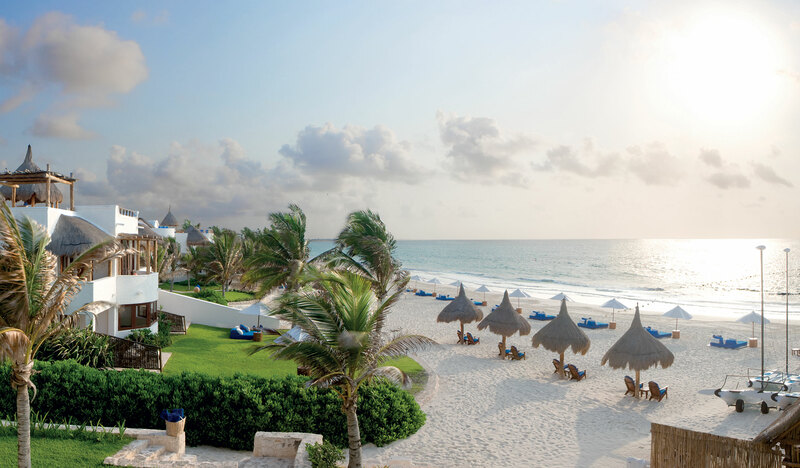 Originally the hacienda of Mexican architect Jose Luis Moreno, Belmond Maroma has slowly extended along the shoreline. The entirety of the resort is aligned with the ocean, with a buffer of jungle behind, meaning that most of its 63 rooms and suites are ‘ocean view’. However, this is no cookie cutter experience: nestled between beach and jungle and connected via shaded paths, the accommodations have the feel of residences, each with individual personalities. In my Ocean View Master Suite, the thatched roof is retained in the interior of the living room, but lit with a chandelier and spot lighting for dramatic effect. The sofa’s thick sage cushions and inbuilt side tables recall mudbrick constructions, the irregular tiled floor reflects artisanal aims, and contemporary fabrics cover intricately-carved chairs. It’s an elegant confluence of old and new. In the bedroom, the mudbrick style continues through to the oversized bedside tables, though it’s a huge embroidered cushion I’m really coveting. The bed looks out onto a terrace, and the beach and sea beyond, this beautiful view reflected in a large mirror above the dressing table. An almond-shaped bath is the centrepiece of the bathroom, which also features dual hand-painted ceramic sinks and is stocked with Yucatan Herbal organic products: I’ll be swiping the aloe after-sun and delicious coconut lotion as I leave. 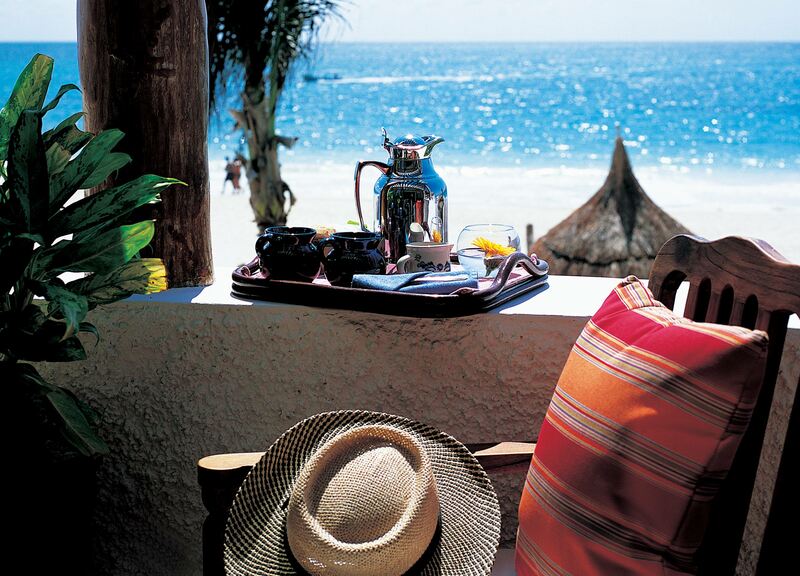 Tea on the terrace of the master suite. 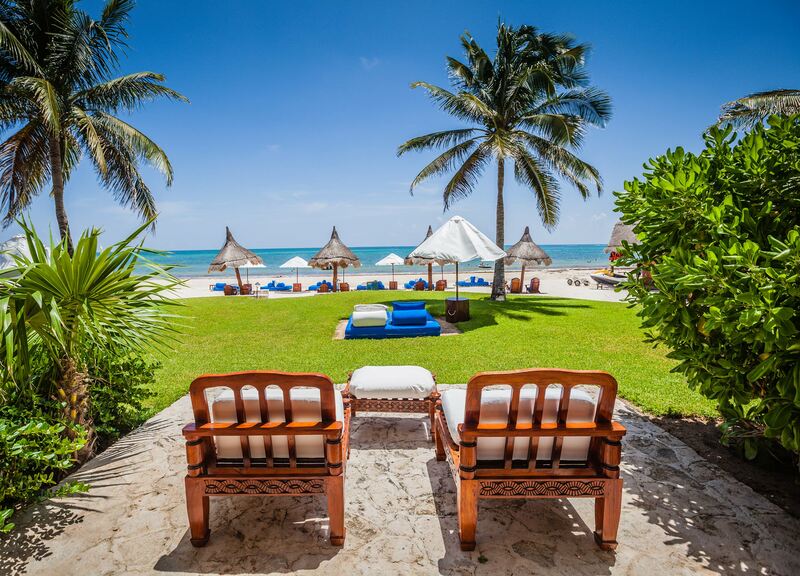 Belmond Maroma has recently garnered a five-star Forbes rating, one of only six hotels in Mexico to boast the honour. The general scene is one of a tropical paradise, with palm trees and lush gardens set along a white sand beach welcoming the turquoise water of the Caribbean. 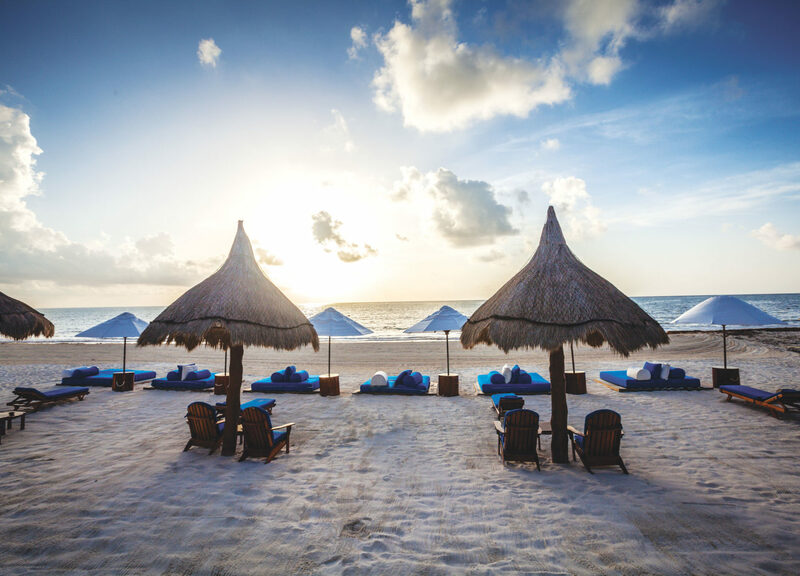 Thick blue mattresses with ingenious roll pillows are sheltered by large white or thatched umbrellas. It doesn’t feel crowded at all, a welcome departure from comparable resorts along this stretch of coast. A terrace overlooking the ocean. I stop for lunch at El Restaurante, where the menu is inspired by different Mexican states, using regional sustainable ingredients. The décor is simple white and wood, with tasteful greenery on the tables echoing the gardens outside. I learn that priority is given to local vendors for both furniture and food. Branching out, I sample the crickets, a crunchy and tangy topping for the house special guacamole, along with a traditional Zihuatenejo ceviche — one of nine varieties on offer — and a fabulously refreshing gin and tonic with coconut water, cucumber and mint. A colourful plate of vegetables sampled at El Restaurante. 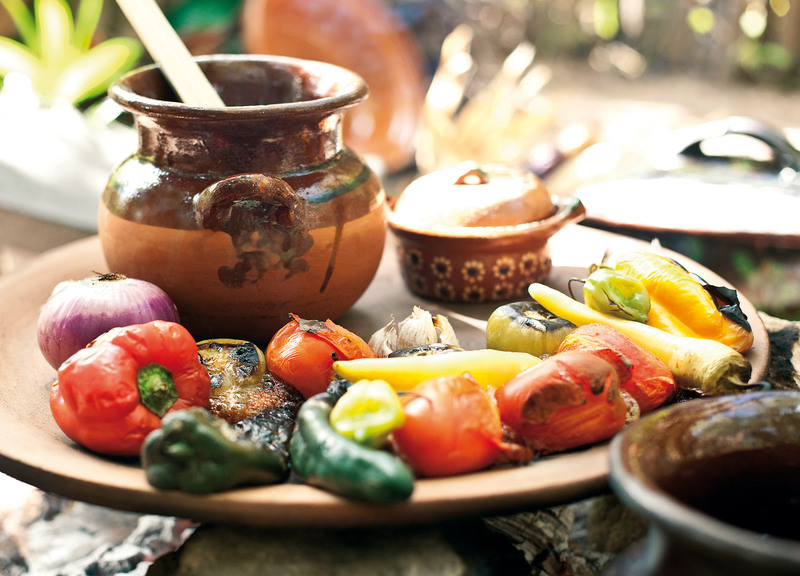 Other options for cuisine take a similar approach, riffing on aspects of Mexican culture. La Cantina is modelled after a typical Mexico City bar: offering mezcal and tequila in an intimate setting, it’s perfect for group celebrations. Outdoors, Freddy’s Bar serves up 120 different tequilas, and more unexpectedly, fresh sushi and sashimi with a Mexican twist. All these elements work together to build an unmistakeable sense of place. La Tia making quesadillas at the Belmond Maroma. Before long, it’s time for my appointment at Kinan Spa. The quiet, cool path to the spa is said to invite contact with nature and self. Named for the healing energy of the sun, Kinan draws on sacred Maya geometry, similar to feng shui. Design balances male and female icons: in the fertility fountain, flowing, feminine water navigates around an 80 year old, masculine tree. This sense of balance extends to the activities on offer: a paint-your-own-mandala is not just for hippies; increasingly, jetsetting executives are prioritising destressing rather than constantly checking emails, noting that such balance allows greater focus. There is a theme of letting go and moving forward: at the spa, a stretching pool ritual is said to unblock fears and prepare for new beginnings. A labyrinth of seven circles — constructed of river stones and coral recovered from Hurricane Wilma — guides guests to a sacred tree, where they may leave the past behind and make requests for the future. At the other side of the maze, I find a hive of stingless Melipona bees, both culturally and ecologically significant as sacred insects to the Maya and pollinators of plants and trees, especially those of the Sian Ka’an Biosphere Reserve. The all-female hive produces around two litres of honey per year, which is said to have strong healing properties. 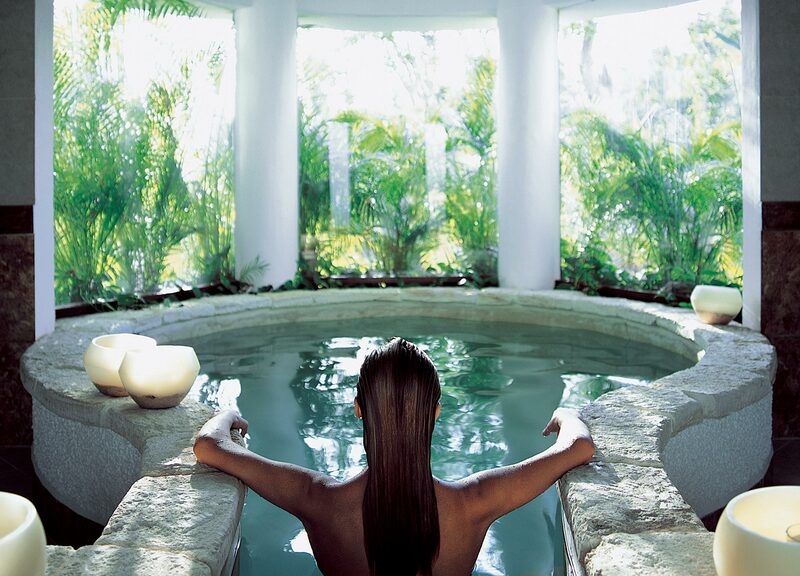 A stretching pool ritual at the Kinan Spa is said to unblock fears and prepare for new beginnings. I enter the Kinan Spa treatment room with masseuse Carla, and a foot wash and salt scrub get me straight into relaxation mode. Massage is always a gamble at a hotel with an unknown masseuse: often too timid, or torturous. However, Carla is an expert — one short exchange about preferred pressure and trouble areas, and she nails it. It’s the Goldilocks of massage: not too soft, not too hard — just right. Carla’s skilled hands locate points of tension I didn’t know existed, and her forearms and elbows mean business. Her technique is drawn from Hawai’ian lomilomi, which she describes as “like a dance.” The sound of rushing water from the fountain outside supplements the requisite relaxation music. I inhale the scent of chamomile — whether it’s the massage or the oil, I feel I can breathe easier. On return, fairies have snuck in and turned down the room: I’m feeling very well looked after. The sky darkens and the sea loses its brightness but not its interest, as palms and thatch blow back, waves crash, and wind and rain create ripples in the pool. I’m not disappointed in the slightest with this turn of events, as I watch the display safe in the shelter of my large terrace. The bamboo and beam ceiling creates continuity between inside and out, and inset lights glow on pillars as I sink into the daybed’s pile of oversized cushions. At dusk, the resort lights up, with 1000 candles scattered through the grounds: it’s nothing short of magical. I meander along garden paths to dinner at El Sol restaurant, where Mediterranean tapas are interpreted through a distinctly Mexican lens. The wine list is impressive, with options from South America, the States, and New Zealand, and a whole page dedicated to varieties of Champagne. A French pinot gris accompanies a delicately crusted and creamy fried brie with guava and hibiscus jelly on a bed of arugula, followed by a perfectly tender Kurobuta pork chop, accompanied by Asian greens and sweet potato puree with Maya honey. I give thanks to the bees. 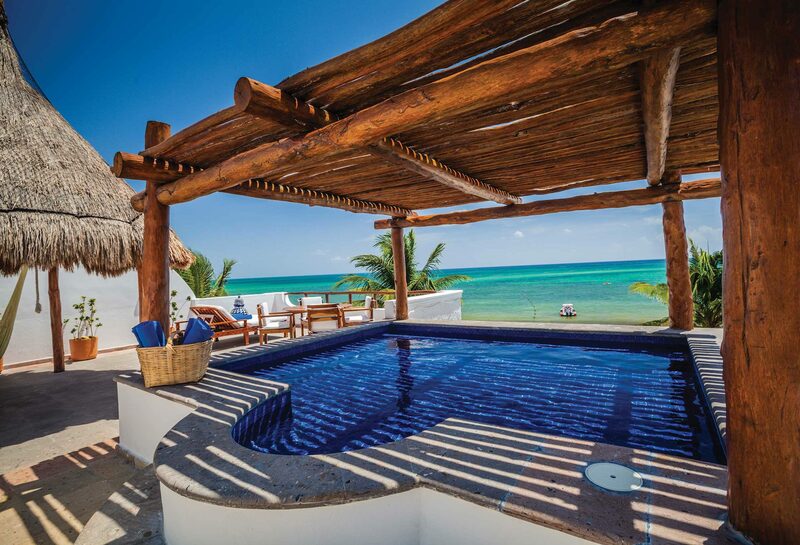 I stroll along the beach back to the suite, and relax in the tub, reflecting on my time on the Yucatan Peninsula. Slipping on Belmond’s embroidered white kaftan — no boring bathrobes here — I’m struck by what an impact the resort has had in such a short amount of time: I’ve been here a matter of hours, but feel like a new person, recalibrated by an artful balance of nature, culture, wellness and indulgence. It’s the perfect conclusion to an illuminating trip, drawing on all this rich region has to offer.